Astronomy, considered as one of the oldest sciences, is the scientific study of celestial objects (such as stars, planets, comets, and galaxies) and phenomena that originate outside the Earth's atmosphere (such as the cosmic background radiation). With the aid of powerful telescopes, Astronomers were able to study our vast skies. 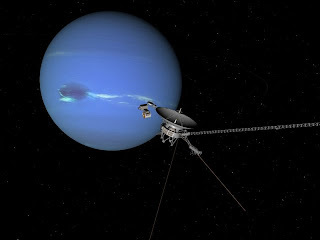 Since accurate and reliable software related to Astronomy are plenty these days, anyone has the opportunity to thoroughly learn it without the need for telescopes. *Celestia is a 3D astronomy program created by Chris Laurel. The program, based on the Hipparcos Catalogue, allows the user to display objects ranging in scale from artificial satellites to entire galaxies in three dimensions using OpenGL, from perspectives which would not be possible from a classic planetarium or other ground based display. NASA and ESA have used Celestia in their educational and outreach programs, as well as for interfacing to trajectory analysis software. Celestia is available for Linux, Mac OS X, and Microsoft Windows. Released under the GNU General Public License, Celestia is free software. *INDI (an abbreviation of Instrument Neutral Distributed Interface) is a Distributed Control System protocol to enable control, data acquisition and exchange among hardware devices and software front ends, with particular focus on astronomical instrumentation. -Switch property (Represented in GUI by buttons or check boxes). -Light property (Represented in GUI by colored LEDs). INDI provides powerful scripting facilities that enables complete device automation. *KStars is a planetarium program for the KDE desktop for Unix-like computer operating systems. It provides an accurate graphical representation of the night sky, from any location on Earth, at any date and time. The display includes up to 126,000 stars, 13,000 deep sky objects, all 88 constellations, all 8 planets, the Sun and Moon, and thousands of comets and asteroids. It has features to appeal to users of all levels, from informative hypertext articles about astronomy, to robust control of telescopes and CCD cameras, and logging of observations of specific objects. The latest version of KStars is 1.3.0, released with KDE 4.0. Released under the GNU General Public License, Kstars is free software. *PP3 is a free software that produces sky charts, focussing on high quality graphics and typography. It is distributed under a slightly modified MIT License and available for Linux and Windows. Sky charts are produced as LaTeX files, so an installation of LaTeX and Ghostscript is required to obtain results in PostScript or PDF formats. Knowledge of command line syntax for these packages is however not required, as PP3 can run the conversions automatically. Wikipedia's own star charts are produced by PP3. Most of these are in the constellations category. 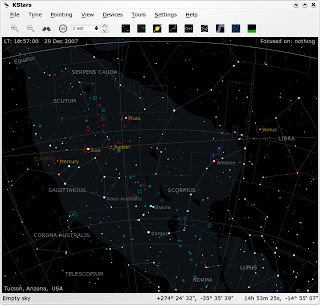 *Stellarium is a free software planetarium, licensed under the terms of the GNU General Public License, available for Linux, Windows and Mac OS X. It uses OpenGL to render a realistic sky in real time. 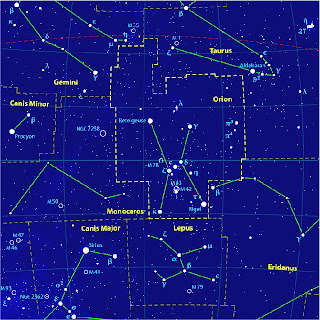 With Stellarium, it's possible to see what one cannot see with the naked eye, binoculars or a small telescope. 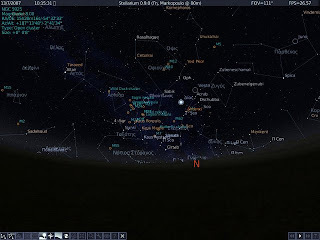 Stellarium is developed by the French programmer Fabien Chéreau, who launched the project in the summer of 2001. Other prominent developers include Robert Spearman, Johannes Gajdosik, Matthew Gates, Nigel Kerr and Johan Meuris, who is responsible for the artwork. *XEphem is a Motif based ephemeris and planetarium program for Unix-like operating systems developed by Elwood C. Downey. -About 452 million stars from both the Tycho-2 Catalogue and a magnitude limited subset of the Guide Star Catalog II. -About 288,000 minor planets and comets orbital elements from the IAU Minor Planet Center and Lowell Observatory (that can be updated), and other specialized catalogs. -It also includes the Digital Lunar Orbiter Photographic Atlas of the Moon. XEphem is a client for Internet data sources such as the Digitized Sky Survey, Solar and Heliospheric Observatory, AAVSO light curves, and global temperature and cloud coverage. 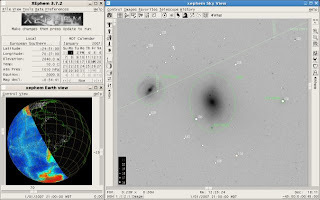 Through the Instrument Neutral Distributed Interface, XEphem can control some models of amateur telescopes, such as by Meade, Celestron, and Vixen, and auxiliary telescope components. If you know of other free and open source Astronomy software that I failed to include above, please share them with us via comment. Yet another planetarium program: http://aciqra.caglow.com It's somewhat slow but certainly usable.